The Read Text File action enables you to automate the reading of a text file. You can read the text file into a FinalBuilder variable, and also process each line in the OnReadLine event. Specify the name of the text file to read. Specify this option (and a variable) so that you can examine and manipulate the contents of the file in subsequent actions. When the action executes, the "OnReadLine" event is called for each line of the text file which makes it easy to process the file line-by-line in script. 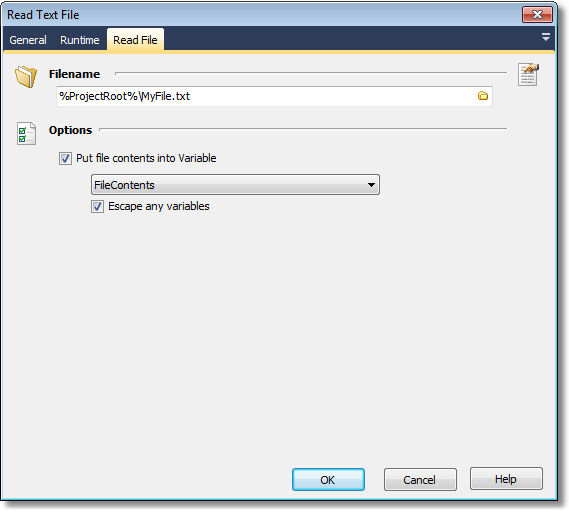 Specify this option to escape any variable references in the source file. For example, if the source contains % signs then they will be replaced as %%. This means that you can safely use an action which expands variable references in the variable contents, without errors.